Also if album art size less than 10k, it will not show up in MPDriod neither, again there was not a problem using Nginx web server with above instruction. wish you can take a look if you have time. By the way if you are interested about using computer as speaker crossover, this is a great article by Richard Taylor, he also the owner of LX521 speaker, I am using his approach to config the .4 version of the speaker emulating the .4 ASP transfer. 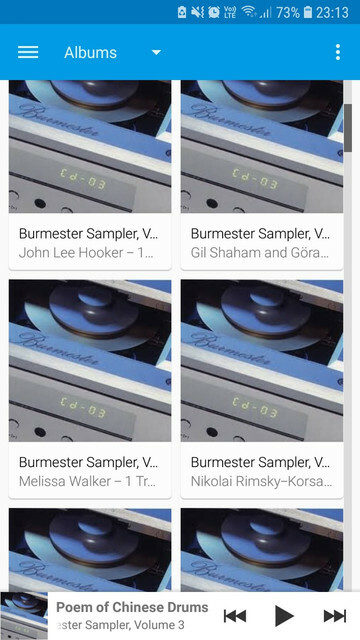 Your MPDroid client may be looking up the cover art from the Internet. Go into the settings to disable that, and configure the cover art settings according to the article here. Scroll down until you see the section MPD Client - Folder Art. (16-Jul-2018, 11:56 PM) vv329 Wrote: Also if album art size less than 10k, it will not show up in MPDriod neither, again there was not a problem using Nginx web server with above instruction. wish you can take a look if you have time. In theory there shouldn't be a problem between nginx or lighttpd (the web server that's currently installed in Snakeoil OS). And lighttpd is capable of serving files of all sizes. However, the Linux operating system is case sensitive, so make sure your album art all have a consistent case - e.g. call them all folder.jpg. Also make sure you're using the same encoding - e.g. if you're using JPG format don't use a file that's encoded with PNG but in the JPG extension. (16-Jul-2018, 11:56 PM) vv329 Wrote: By the way if you are interested about using computer as speaker crossover, this is a great article by Richard Taylor, he also the owner of LX521 speaker, I am using his approach to config the .4 version of the speaker emulating the .4 ASP transfer. This looks cool.. Thanks for the link.. Hopefully one day I can incorprate this into a easy to use GUI for a future release.